What Day Of The Week Is December 27? 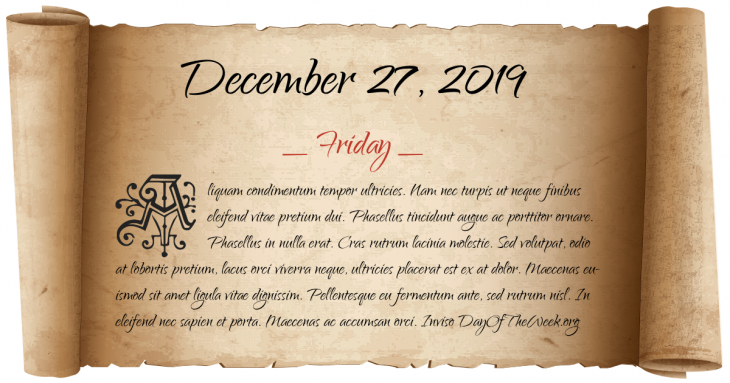 December 27, 2019 is the 361st day of the year 2019 in the Gregorian calendar. There are 4 days remaining until the end of the year. The day of the week is Friday. Charles Darwin embarks on his journey aboard the HMS Beagle, during which he will begin to formulate the theory of evolution. The worst ever avalanche in England occurs at Lewes, Sussex, killing 8 people. Erzincan, Turkey is hit by an earthquake, killing 30,000. Spain becomes a democracy after 40 years of dictatorship. The company Clonaid announces that it has successfully cloned a human being, although it has never presented any verifiable evidence. Iranian election protests: On the Day of Ashura in Tehran, government security forces fire upon demonstrators. Who were born on December 27?